This month I’ve prepared a special cd-mix: Adam White – Best Of Vol.2. My cd-mix includes well known Adam White remixes, classics and bootlegs but also some of his recent releases and collaborations. Enjoy! Tic Tac Trance #111 Replay available! 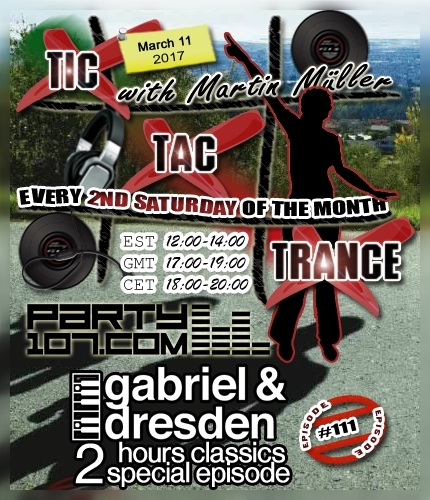 Tic Tac Trance returns on March 11 2017 with episode #111 on Party107.com. For this episode I’ve prepared a special 2 hours Gabriel & Dresden Classics Mix! You can expect rare unreleased versions & demos of timeless classics by Gabriel & Dresden but my mix will also include Josh’s and Dave’s projects & collaborations like Motorcycle, Andain and lots of well known vocal anthem classics! Make sure to tune in!